According to Forbes Magazine, in the 70’s the average person was exposed to approximately 500 commercial messages a day. In 2005 the number was 3200. Today, estimates have jumped as high as 30,000. With all that going on, with all the noise and distraction, how do we focus on the things that are important. In fact, how do we focus at all. Dr. James Loehr said, “We have the right focus when what we are doing is the same as what we are thinking.” That’s pretty simple. Part of a very complicated act (focusing) is that we focus when we are in the moment; totally mindful and aware of what we are doing in the present. With all of the distractions the world offers, however, it can be a very difficult task. So, in the spirit of becoming better, let’s take a look at 3 Ways to Become More Focused. 3. Cut distractions. Having already mentioned the clearing of our brains, we can aid that process through the clearing of our physical space. Begin with a clear work area, free from spatial anxiety. Create distraction free time blocks. No internet, no phone, no email or social media. Sound scary? Rock says, “Twenty minutes a day of deep focus could be transformative.” Ages ago, Rick DeLuca promoted use of a STOP sign to be used at the desk or office. Basically it notified anyone coming into this distraction free space that they should keep it that way. I will often adorn myself with noise cancelation headphones to block out the world (no, nothing coming through them, music or anything, just a guarantee of silence). 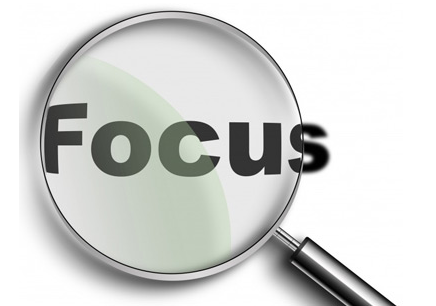 The bottom line is this: fewer distractions = better focus. It is not possible to be 100% focused, 100% of the time. In fact, would would want that? But in appropriate chunks, when we focus, we win. Proverbs 4:25 (yeah, a Bible quote) says, “Let your eyes look directly forward and your gaze be straight before you.” Great advice.